On Monday night I watched most of the PBS program "The Magnificent Voyage of Christopher Columbus." I would encourage anyone to watch it, it was pretty darn balanced. Still, I find it odd that today so many Dems and Libs harbor a seething, vitriolic hatred for Columbus. He was a European, and we all know the Dems and Libs loooooooooooooove the Europeans and try their best to influence and model us (Americans) and our government to lean more towards being "more European." 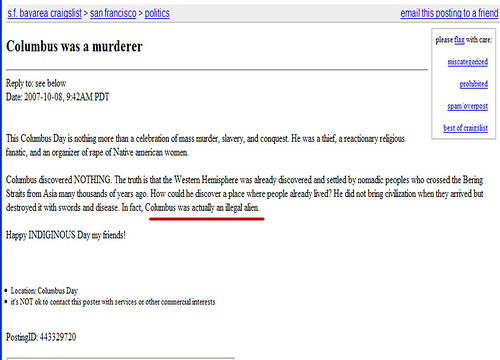 So why all the hatred of Columbus, Libs? 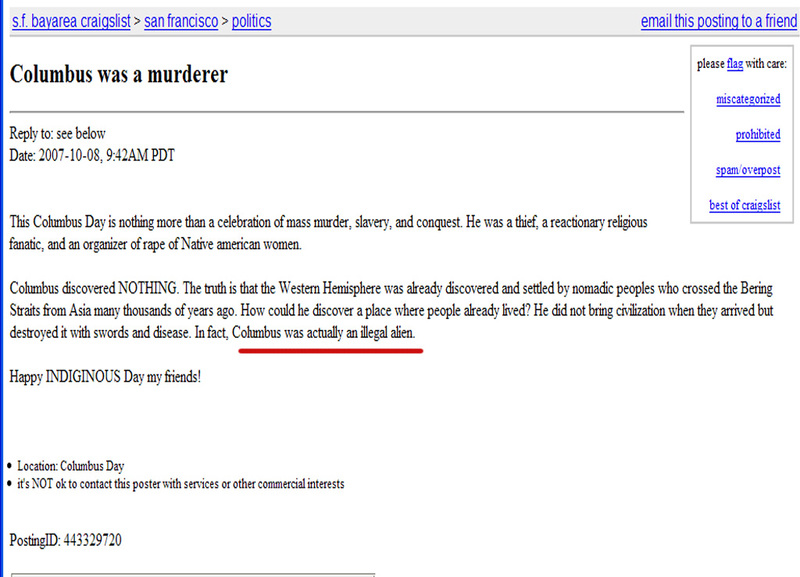 For Libs and Dems to accuse Columbus of being a "mass murderer" is also rather hypocritical and paradoxical of them. Stanley "Tookie" Williams was a mass murderer, and yet many Liberals advocated for his freedom and begged that leniency be shown with regard to his death sentence. And certainly Columbus did not kill more innocent people than did Democrat President Harry Truman when he sanctioned the dropping of two Atomic Bombs, one on Hiroshima and another on Nagasaki. When was the last time you heard a Dem or a Lib call Harry Truman a "mass murderer"? The writer notes that "Columbus was actually an illegal alien." Why - what's wrong with that? If he were alive today and illegally entered the U.S. - the Libs would want to give him free health and medical care and would allow him to qualify for Social Security compensation. Objectivity shows how Columbus' was essentially a man of reason, science, and courage for his discovery of a continent unknown to Europeans. To multiculturalists, however, this historical view is "Eurocentric" bias. Their primary appeal is that they only want to "balance" history by including the "perspectives" of other cultures. Thus, multiculturalists teach that Columbus didn't discover an unknown continent; what distinguishes him and his Western predecessors is how they destroyed the relaxed, peaceful, nature-worshipping cultures that already existed there, by "invading," "stealing" from, enslaving, and committing "genocide" against their inhabitants. But even though Columbus didn't discover a continent entirely unknown, he did discover it for Europe and essentially he planted the seeds there for a culture that eventually enabled humans to discover their greatest life- improving potential. Far from being "genocide," the deaths of most Indians after Columbus' arrival came from such diseases as measles and small pox that Europeans unintentionally transmitted to them, just as Indians had transmitted diseases to them. Moreover, when Europeans maltreated Indians, it was no worse than how both cultures treated themselves. Besides many Indian tribes enslaving and ritually sacrificing the lives of their individual tribesman, they constantly invaded, warred with, looted and enslaved other tribes. Individualism was alien in Indian cultures, and ownership was based on whatever arbitrary rules each tribal chief dictated to his people. Under such anarchy, Europeans had as much right to "their land" as Americans had to the Nazi's native Germany. Did Columbus "discover" America? Yes -- in every important respect. This does not mean that no human eye had been cast on America before Columbus arrived. It does mean that Columbus brought America to the attention of the civilized world, i.e., to the growing, scientific civilizations of Western Europe. The result, ultimately, was the United States of America. It was Columbus' discovery for Western Europe that led to the influx of ideas and people on which this nation was founded -- and on which it still rests. The opening of America brought the ideas and achievements of Aristotle, Galileo, Newton, and the thousands of thinkers, writers, and inventors who followed. Prior to 1492, what is now the United States was sparsely inhabited, unused, and undeveloped. The inhabitants were primarily hunter-gatherers, wandering across the land, living from hand-to-mouth and from day-to-day. There was virtually no change, no growth for thousands of years. With rare exception, life was nasty, brutish, and short: there was no wheel, no written language, no division of labor, little agriculture and scant permanent settlement; but there were endless, bloody wars. Columbus should be honored, for in so doing, we honor Western civilization. But the critics do not want to bestow such honor, because their real goal is to denigrate the values of Western civilization and to glorify the primitivism, mysticism, and collectivism embodied in the tribal cultures of American Indians. They decry the glorification of the West as "Eurocentrism." So - so much for another Columbus Day, until next year where I again will wonder, write and ask why the Dems and Libs display such unbound hatred for someone whom most of them know so very little about but are willing to take their subjectivity and Talking Points from those that hate a discoverer of whose journey and vision they themselves could never attempt to duplicate. but, but, he did not discover america. Nor did he have sexual relations with Monica Lewinsky. You would think Libs would celebrate Columbus Day on the basis that he defied the conventional wisdom of the day; in particular the Catholic Church, which still believed the world was flat. Being against the grain seems to be the icon of so-called "progressives." Ironic how the left eats it's own after 5 centuries. Usually it doesn't take the Left 5 centuries to eat their own. Hey, he was an illegal alien, the Left should welcome him! Did the church still beleive the world was flat in the 1400-1500s? You know my record on remembering historical shtuff. According to Bartolome de las Casas (History of the Indies), who described Columbus's acts as well as the cruelty of the Spanish: "endless testimonies...prove the mild and pacific temperament of the natives...But our work was to exasperate, ravage, kill, mangle and destroy; small wonder, then, if they tried to kill one of us now and then" "The admiral, it is true, was blind as those who came after him, he was so anxious to please the King that he committed irreparable crimes against the Indians..." He also tells that Spaniards "thought nothing of knifing Indians by tens and twenties and of cutting slices off them to test the sharpness of their blades." Las Casas was there when this all happened. Las Casas writes that the Indians were not completely peaceful, because they did battle with other tribes from time to time, but their casualties seemed small. They fought because they were invidividually motivated to do so because of some grievance, not on the orders of captains and kings. He estimated about 3million people died from 1494 to 1508 due to war, slavery and working in the mines. We have to ask ourselves if these atrocities had to be committed in the name of progress and civilization? Sure Columbus brought European influence to America, but we cannot deny what else he did to the native inhabitants. These are facts that should not be ignored. Thank you for your comment Angela. You are aware that much of what Las Casas wrote about Columbus has been debunked. I'm not saying Columbus was a saint. But the attempts by history revisionists to depict him as a blood thirsty indiviual simply are untrue. The Indians treated other Indian tribes far more violently than did Columbus.